World Book Day: My Favourite Reads. It’s World Book Day today!! Having spent a fabulous weekend at the Stoke Lodge Hotel, near Dartmouth (Devon, UK), celebrating World Book Day early with the wonderful Annette Shaw from Devon Life magazine – hearing a wide variety of talks from all sides of the writing world- as well as from those whose jobs are made so much easier by sharing the joy of reading – I thought I’d share my favourite books with you. As a child I read from an early age. Once I’d discovered the joy of books I never looked back. I would spend many happy hours locked in the world of The Folk of the Faraway Tree (Enid Blyton), with the likes of Moonface, Silky and Saucepan Man. I explored the imagination of Roald Dahl with The BFG. I got lost in the tales of British Myths and Legends, and walked through the trees with The Animals of Farthing Wood (Colin Dann). 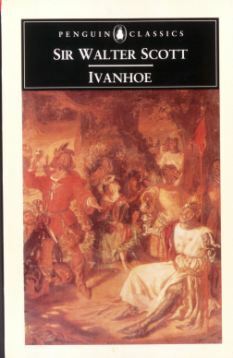 By the time my teens arrived, I was seldom without a Robin of Sherwood novel (Richard Carpenter/Robin May/Anthony Horowitz), and I read Ivanhoe so often the cover began to fall off the book. 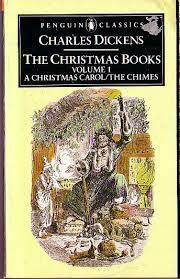 The book that stuck with me the most however- one I recall my final year primary school teacher reading to us a class each day before home time – was The Christmas Carol by Dickens. I can’t begin to describe how much I love that book. I have several copies of it, from children’s Ladybird editions, to one beautiful work written in a calligraphic style. It took me into a world of Victorian realism, hope and magic that was far removed from the awfulness of being a shy child with low self esteem in the 1980’s. As I grew, my tastes expanded, and now it’s a rare day when I don’t have a murder mystery or a chick lit novel awaiting my attention by the side of the bed. Whenever the days are tough doing, I will reread The Rose Revived by Katie Fforde, as it never fails to lift my mood. When I want to laugh out loud, I reach for my trusty copy of Men at Arms – or possibly Masquerade (I love them equally) – by the much missed Terry Pratchett. 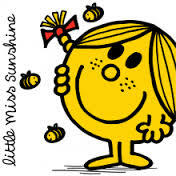 And if I just want to smile, I will re-read my all time favourite children’s book – Little Miss Sunshine (by Roger Hargreaves)– a character who I have always loved, and who appears on a great many objects around my house, from mugs to toothbrush holder. 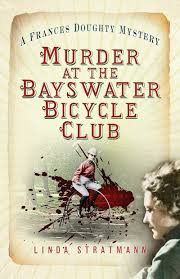 At the moment I am happily devouring Murder at the Bayswater Bicycle Club by Linda Stratman – the latest in the Frances Doughty Mysteries– a series I adore. The magic of reading- or being read to- never falls to amaze me. It is therapy- it is hope- it is escapism- adventure- romance- an adrenalin rushing fear with a solution….and so much more. So today, rather than put the TV on when you get home, why not curl up with a good book? Read to your child, read to your partner…just read. You never know where the words will take you. If you aren’t sure which book to read, I have written one or two! Just see the links at the top of the page. Yes, curling up with a good book is a pleasure but, at least in our household, it is a solitary one. Two people sitting in the same room reading different books do not communicate at all. TV, on the other hand, although often decried as breaking up families, is an opportunity to sit together continually interrupting the programme (even easier with on-line where you can pause) as you come up with your own idea whodunnit, argue about whether you really could outrun the car in the multi-storey carpark or just insist that the secretary was the woman who went on to star in that film with whassisname. Books, on the other hand, are ideally suited to the loo, the bath or public transport. Or a blissful afternoon when your significant others have their own plans and you can just curl up with a nice cup of tea (or coffee, in your case, Jenny) and some me-time. 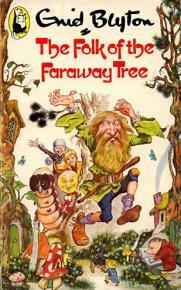 Oh, I loved the Faraway Tree books and escaped to that world for many hours on end. I hated ‘lights out’ and would hide the books under my covers, then pull back back the curtain to read by the light of the street lamps!